Thanks to everyone who participated in Caption Contest 94, I appreciate your willingness to share your creativity. I've chosen a handful of those entries as Finalists, the ones I thought were the funniest of the funny. After I've posted them all, I'll announced which of them is the winner. I hope you enjoy seeing them in the panel as much as I do! CPrime: My words… are incredible. I like the mirrored inversion of the narration, it's a nice meta-comment that breaks the "fourth wall" as it were. dblade: Baby, in this crazy four color world, cyan and yellows just don’t mix. Find yourself a nice magenta fella to settle down with. There were a number of entries based around the coloring of the two characters, but I thought this one was the cleverest and best worded. You gotta love color theory! Joel: I just saved a bunch of money on car insurance by switching to Geico. What makes this funny to me is that I can totally see Geico running a series of web ads exactly like this, replacing classic panels with their slogans. Mr.MikeK: I like the way Rob Liefeld draws feet and thigh pouches. Now THAT is incredible, and guaranteed to make someone gape in awe! One of the few that genuinely made me laugh out loud. 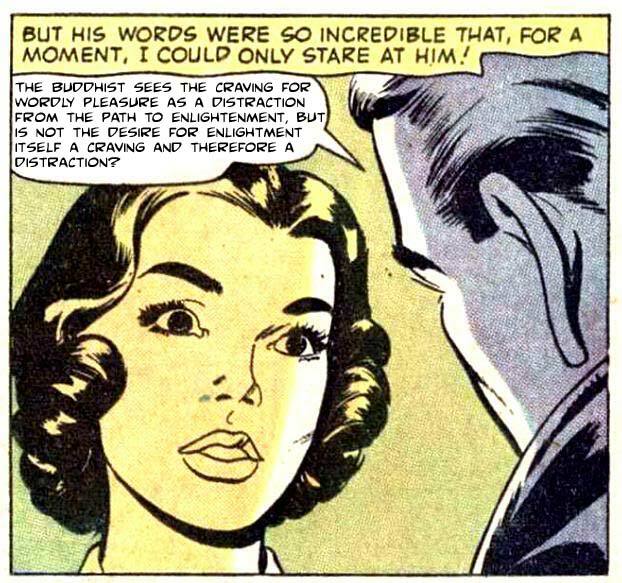 Sutter Kaine: The Buddhist sees the craving for wordly pleasure as a distraction from the path to enlightenment, but is not the desire for enlightment itself a craving and therefore a distraction? One of the few that genuinely made me think! I also like how unexpected that sort of comment would be in what is clearly a Romance Comic. X-Stacy: Look here, darling, if I seem unreasonable, it’s only because you’ve no ability to reason. Rocket science is no career for a woman. Another one that is funny partly for its being so out of place in a romance comic. Plus that's just a funny turn of phrase, very artfully crafted. Ah yes, nothing makes a joke funnier than explaining it, right?! Anyway, the one that really stood out to me all week was one of the very first submitted, and that is Patrick's "Glee snuggle"! Well done, Patrick! Let me know what you'd like for your prize either in a comment here, or via email (afdstudios@gmail.com). 15 Responses to Caption Contest 94 Winner! Nice job, Patrick! Your entry was amusing and actually hit close to home for me. Yes, I watch Glee with my lady. I’m a sucker for shows with musical numbers. Yes. It is truly a miracle if a man takes rubbish out and does anything else for the house without a woman telling him. Your quote was definitely the most amazing of all. I loved it from the first reading. Congrats, Patrick. I figured something making fun of 1950ish husband/wife values would win, and I was right. Very funny, and perfect for the panel! But anyway, congrats Patrick and to the rest of the finalists. I loved every single one of them. X-Stacy’s and Mike’s get me every time…. I am so stealing “Glee snuggle”. Even though I’ve never watched an episode. I’m always up for snazzy catchphrases. At work, I tend to use “Yeah, cloud” as my non-plus reaction to someone stating the obvious or a meaningless win. To which they now can reply “Glee snuggle!” Oh, I’m going to drive people insane! Use it as a greeting at the next -Con. Instant way to recognize a fellow HM’er. Congratulations Patrick. That was one of my favorite as well. Yeah, Punk. I can totally see how that would drive someone nuts. I’m imagining one of my friends doing that to me. I feel like Wile E. Coyote after he caught the Roadrunner. Okay now what do I do? Patrick, sorry for the delay — just reply in a comment here (or really, to any post on the blog), or use the “Contact Us” form at the top of the right column, or email me directly at afdstudios@gmail.com with your prize request. If you can’t think of any item you want, and you don’t want a portrait, and the Sketch of the Day idea doesn’t appeal, you can “donate” your prize and I’ll just take the next entry on the “Replacement Prize” list.